Conjure up the anticipation of a child on his birthday; add to that the exhilaration of the unknown; and multiply it all by thrill of a challenge–this is waterfall rappelling! It’s a romp through the rainforest and a dazzling descent through crystalline water, an adventure that will spike your adrenaline and leave you begging to do it all over again. That’s why you chose to vacation in Costa Rica, after all! 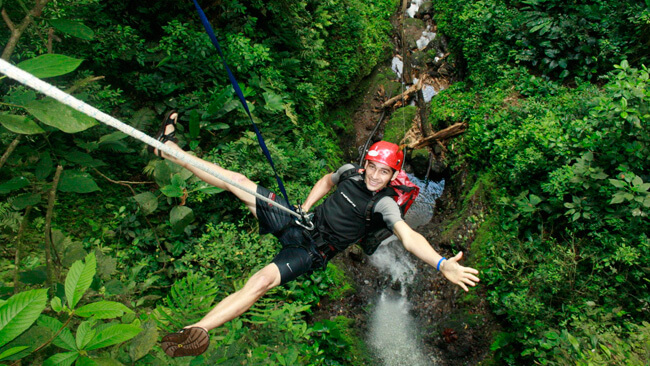 Waterfall rappelling, also known as canyoning, is one of Costa Rica’s most thrilling and popular adventure sports. The concept is simple: suit up in a harness and belay your way down a waterfall. In practice, the sport is more exciting, more fun, more everything than you could ever imagine. It involves hiking, climbing and, yes, rappelling on a tour that creates memories to last a lifetime. Always wear lightweight or quick-drying clothing and your most water-resistant shoes. And if you can bear, leave the camera behind (most tours include a photographer who snaps pro photos as you descend the falls) or ask about bringing your GoPro. Rincón de la Vieja often feels like the corner Costa Rica forgot, its wild adventures barely teetering on the right side of civilized. That’s exactly how you’ll feel, as the the tension and excitement mounts on the 45-minute horseback ride out to Victoria Waterfall. The roaring cascade is housed within a mossy canyon, a cool pool at its base. Rappel down the rocky cliff face if you dare, and be sure to spend a few minutes lounging in the swimming hole. Just outside Manuel Antonio, the ever-popular Indian Falls plunge 90 feet down a picturesque, mossy cliff face. After you face the main cascade, hip-hopping down the falls’ slick surface, one more major thrill awaits: the 45-foot “monkey drop,” an all-out free-fall jump into a deep, natural pool below. Round up your courage, because this is one challenge you’ll want to overcome–and likely more than once! Tackle the Osa Peninsula’s Remanso Canyon, home to four waterfalls–four cascades that you will descend one by one, each growing ever taller and more challenging. The extraordinary setting is home to dense rainforest and a scenic river that connects each fall to the next, finally leading to the ultimate challenge: the final cascade, a 70-foot drop into rushing water below. Get lost in the wilds of Arenal, where a secluded canyon awaits with not one, not two, but four waterfalls that will test your mettle and strengthen your resolve. The adventure begins with the 15-foot test run, to boost your confidence and get your adrenaline flowing. Then you’re ready to jump into the great abyss: a 150-foot cascade that plummets more than 15 stories. And if you think that’s the final challenge, you’re be very, very wrong. The big daddy, challenge-of-all-challenges awaits: a 210 foot waterfall that curls your toes as it excites you senseless. Rise to the challenge of Los Chorros Waterfall, a spectacular sight near San Jose and Grecia. The 180-foot giant tumbles down slick, sheer rock, culminating in a sparkling pool below. Los Chorros rappelling is often combined with an even greater challenge: bungee jumping off a nearby bridge.